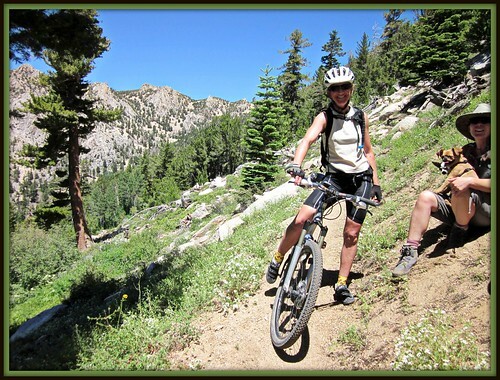 Not long ago, we rode the Tahoe Rim Trail from Kingsbury Grade to Star Lake. We returned the same way we came, and I never got to see what was up over the next pass. Luckily I didn’t have to wait long to find out. Two weeks after the Star Lake Ride, the family and I hiked from Armstrong Pass to Freel Peak, just a couple miles south of Star Lake. We began our adventure on the east side of Armstrong Pass. To get to the trailhead, we drove 4 miles up Forest Service Road 051 which is just 1.8 miles from the Hope Valley Junction on HWY 89 towards Luther Pass (For those driving from the Tahoe side, the Forest Service Road is less than a mile east of Luther pass). This dirt road is badly deteriorated just after exiting the pavement, so high clearance vehicles are highly recommended. Once up over the washed out section, the road is plenty wide, but bumpy most of the way to the trailhead. The trailhead is pretty obvious, as there are usually cars parked on both sides of the road at what looks a parking lot in the woods. There is a road that takes off 180 degrees from the way you drove in, and then quickly heads west over a bridge that spans Willow Creek. 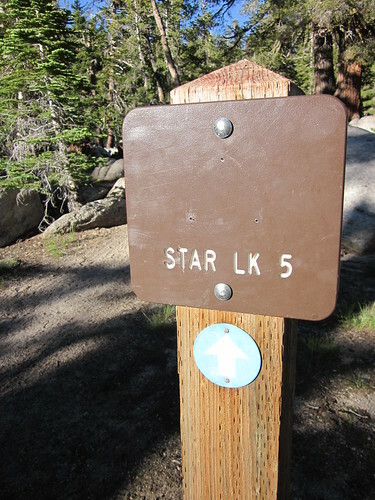 From the trailhead, follow the road .5 miles to a turnaround, and look for the Tahoe Rim Trail signs. 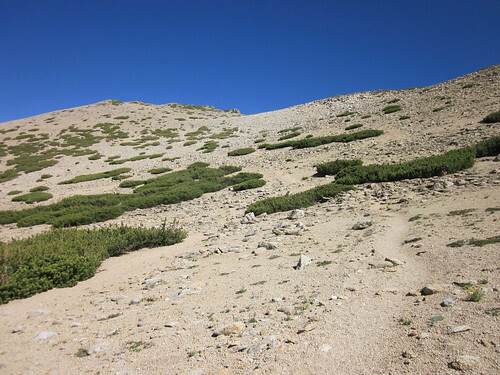 The trail becomes singletrack here, and climbs steeply up to Armstrong Pass. Mountain Bikers will be carrying their bikes for most of this .4 mile section of trail until they reach the pass. There is a 4 way intersection at Armstrong Pass. You can head back the way you came, south to Big Meadow, west down to Fountain Place and Pioneer Trail, or north towards Star Lake and Kingsbury. 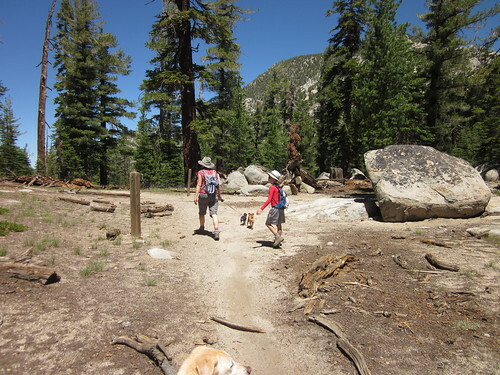 Through the tall pines, we hiked north on the Tahoe Rim Trail along smooth rolling trail. Before coming out into the open, you pass through a short section of huge, very old juniper trees. 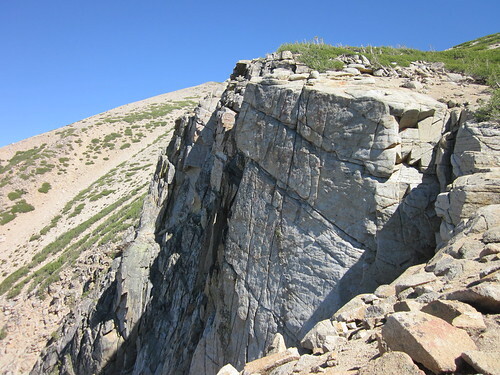 Once out in the open you pass along the base of Fountain Face, a mammoth cliff of granite about a mile north of Armstrong Pass. Fountain Face and Fountain Place, the green meadow below, are named for Garret Fountain. 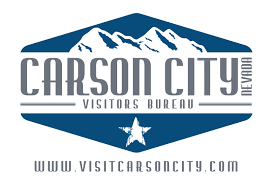 He built a way station at Fountain Place in 1860, betting that Armstrong Pass would be the chosen gateway through the mountains. Although he chose a very pretty location, Luther Pass to the south was chosen as the more desired route. After Fountain Face, the trail begins a steady but gentle climb on its way to Freel Saddle. The narrow and sandy trail is obviously less used this far away from the usual trailheads, and we encountered very few mountain bikers and hikers. 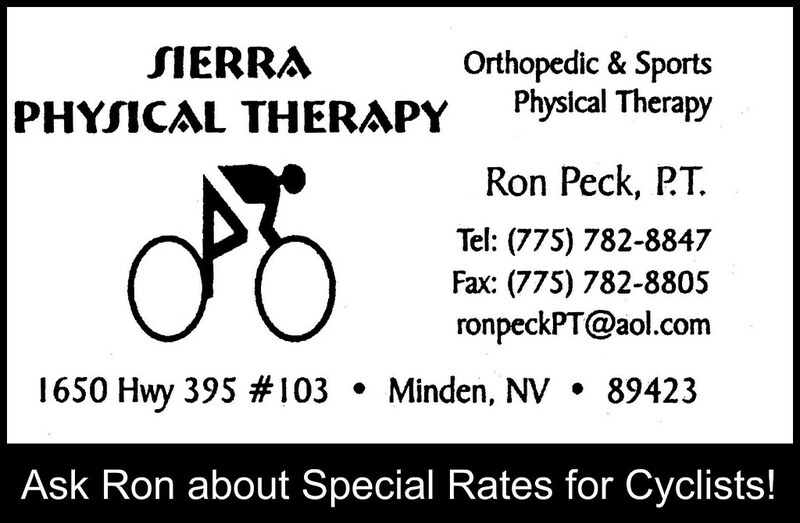 The mountain bikers we did see were mostly headed south, most likely on a one way trip back down to South Lake Tahoe. Before we reached the switchbacks, we ran into our friend Mary Berge. Mary was my son’s teacher last year, and also leads the school’s Outdoor Club. We talked with her for a bit, and I think she was grateful for the rest. She had started at Kingsbury, and still had many miles to go. Having done most of the climb a couple weeks ago, I knew what she had just been through. Most of the teachers of my youth were either spectacled old ladies with their hair up in a bun, or inactive Captain Kangarooish looking men. I always get a kick out of seeing my son’s teacher in action, whether she’s kayaking, repelling down a cliff, out on an epic mountain bike ride, or teaching the kids the proper use of crampons and ice axes. As you get closer to Freel Saddle, there are a few small creek crossings. 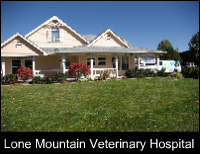 They were easy to get across, and provided a cool rest stop for our dogs. The trail begins to get a bit steeper and starts to switchback up the side of the mountain. We were back in the trees again, and the birds were very active. They seemed to be protesting our arrival. The switch back area was the most difficult area of the trail with its soft sand and frequent steps. It definitely looked more enjoyable in the downhill direction, but we did see one couple coming up the trail. It seemed long on foot, but could probably be done pretty quickly on a bike. 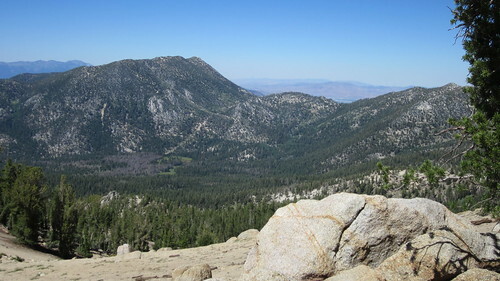 As we approached the saddle below Freel Peak the landscape begin to change. 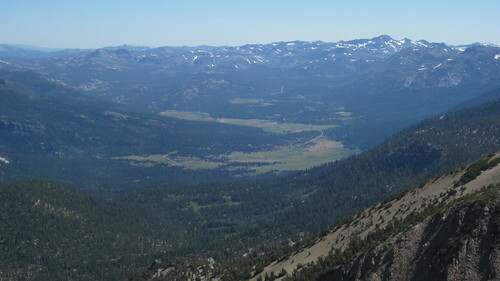 The vegetation started to thin out, and the large rock formations on Trimmer Peak came into view. 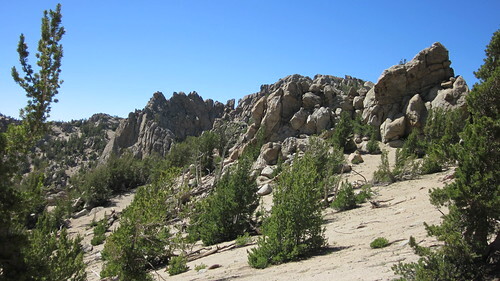 This is a very interesting section of trail, and reminds me of the north side of Monument Peak. It has more of a desert feel to it. You begin to feel very high up as you near the saddle, and for good reason. The pass you are about to reach is at 9,730 feet elevation! When we saw the pass, we got a surge of energy and hurried to the top. 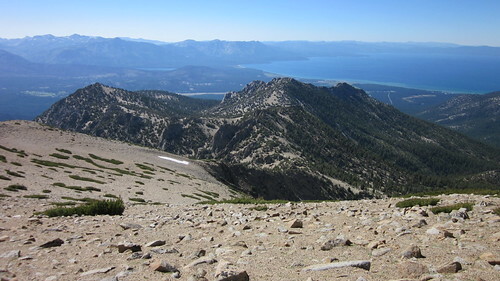 Just on the other side was a fantastic view of Lake Tahoe and Monument Peak! The giant rocks provided a nice wind break and shade, and we setup a base camp for lunch. 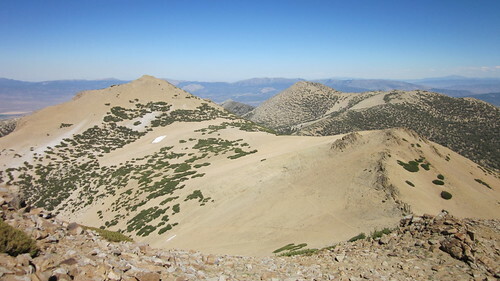 From this point on Freel Pass, it’s 3 miles back to Armstrong Pass, and Star Lake is just 1.9 miles down the other side. 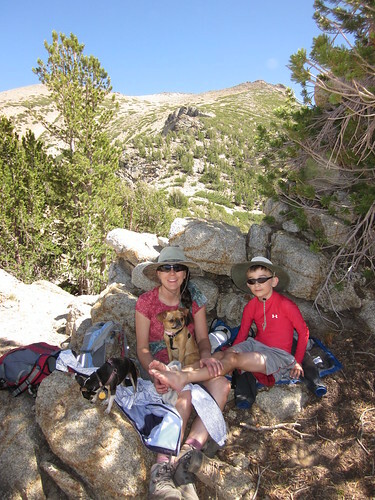 The family and dogs were having a good rest, but I was looking up at Freel Peak behind us. 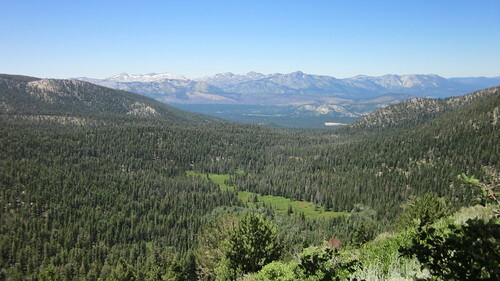 Freel Peak is the highest peak in the Tahoe Basin at 10,881 feet elevation. I wasn’t sure when I’d be back up this way again, and the weather was good. I thought I had better climb the peak while I was there. The trail up the peak begins at the pass, and it’s a mile to the top. It’s a pretty short line on the map too. The kicker though, is that you climb about 1,150 feet in this mile! Not wanting to make my family wait too long, I took off with haste. Unlike the gentle grade of the TRT, the way up Freel Peak is steep! The first part of the trail switchbacks up the side of the mountain about a hundred times, and you’re only walking about 4 feet before you hit the next switchback. 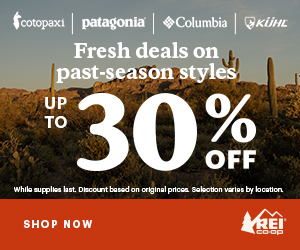 You gain elevation quickly to get above the rocky north face cliffs. There are no bikes allowed on the Freel Peak trail, nor would you want to bring one. 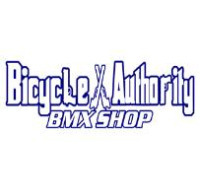 It’s not even close to being rideable; however, it might be cool though to ride up to the pass, lock the bikes to a tree, and then climb the peak on foot. 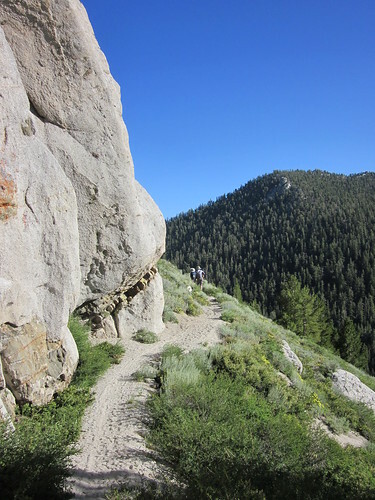 After completing the switchbacks and stairs that seemed straight out of a scene in Lord of the Rings, the trail follows the cliff along the north face of the mountain. You have an awesome view of the bowl below. In fact it was so awesome and vivid that I had a temporary bout of acrophobia that nearly made me crawl on my hands and knees even though I was several feet from the edge! At times I scrambled over rocks instead of taking the trail that came to close to the cliff. I was thankful I didn’t bring the family up here! Once past the cliff, the trail makes a more direct path to the peak across the barren mountainside. It’s still steep and slow going, but the cliff is behind you. There is very little vegetation up this high, and the trees and bushes are dwarfed. I was still trying to keep up the brisk pace and was now pouring sweat and my heart was pounding in my head. I finally made the peak, but at first I wasn’t sure that I had. I came up over a rise to a very small area no bigger than my living room. I had to look around to make sure that I was indeed at the very top. There’s a little rock shelter here and a sign-in book. At first I wasn’t going to sign the book, but then decided why not…I’m here. Some people had taken the time to write poetry. I simply wrote, “I made it!”. I explored the sides of the peak to see what I could see. To the south I could see Hope Valley and the trailhead way down below. To the east was Jobs Sister (10,823′) and Jobs Peak (10,633′). If you had a few more hours to spare, you could hike down and across the saddles to the other two peaks. I’ve been to the top of Jobs, but never Jobs Sister. Jobs sister towers above Star Lake, and I bet the view is awesome. To the north I could see Monument Peak and the area I had ridden just a couple weeks before. It was cool to see the whole picture from this high up and see where I had been. The best view though was to the northwest, the view of Trimmer Peak and Lake Tahoe. Several ground squirrels followed me around the peak, but I had nothing to offer them. I left the food back down with the family. It was hard to get going again, but I knew I had better get down off the mountain. I tried to jog down the mountain to make up some time. Between the jogging, the climb, and the miles hiked that day, it was no wonder I could barely walk for a couple days following the hike. When I got back to the family, they said that I had been gone a long time and that they were about to come look for me. It felt like I had been only gone for minutes! 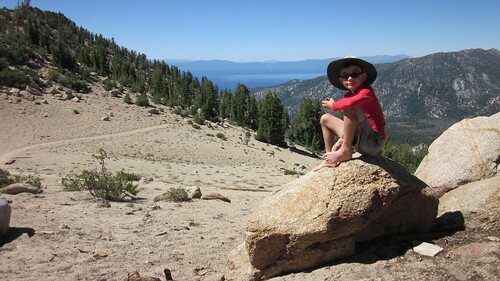 I wanted to lay down, take off my boots and rest, but the family was well rested and ready to get back on the trail. It was about 5PM, and we had about 4 miles to hike back out. My legs were done, and it was at this point that I really wished I had my mountain bike to fly back to the car. The small dogs had to be carried at times, but we all made it out safe and sound before dark. What a great day! The complete photoset of this trip can be found HERE. 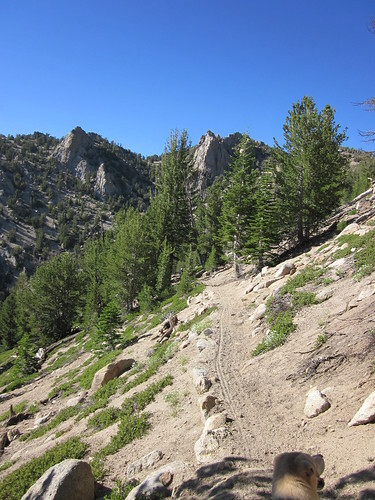 For my rim trail adventures, I’ve been using Tim Hauserman’s guide book, The Tahoe Rim Trail – A complete Guide for Hikers, Mountain Bikers, and Equestrians. It’s full of great trail descriptions, maps, and history, and has many tips especially for mountain bikers. 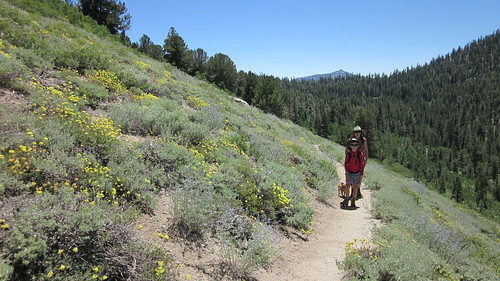 It’s a highly recommended book if you’re going to explore the Tahoe Rim Trail.